The American car market is blessed with a fresh set of premium, sporty station wagons, but which one should replace the SUV in your driveway? It’s long been canon that U.S. car shoppers won’t buy station wagons, and thus automakers won’t bother selling them here. Yet we’re faced now with a fresh crop of wagons that look more enticing than ever before. 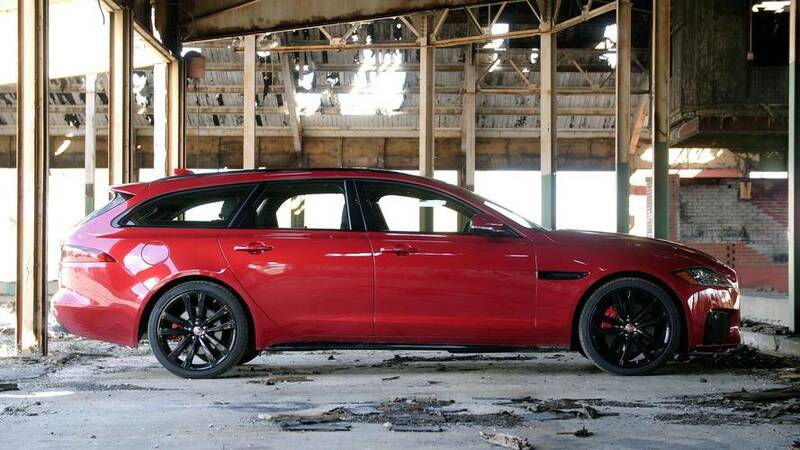 Jaguar, having not sold a long-roof model here since the ill-fated X-Type wagon, tempts us with the new-to-America XF Sportbrake. Volvo’s repartee is the V90, an all-new model that continues the brand’s tradition of offering sensible, spacious wagons. Specifically, we tested the V90 T6 and the XF S trim levels because they’re closely matched in terms of power, pricing, and equipment, and both come standard with all-wheel drive. Although sales of crossovers and SUVs are booming – both Jag and Volvo sell very lovely examples – we still keep a candle burning for wagons because they satisfy both our practical and emotional sides. Like SUVs, they have commodious cargo areas for carting all your belongings, and both these examples offer all-wheel drive for inclement weather. Yet, compared to SUVs, wagons are lighter and lower to the ground, paying dividends in fuel efficiency and driving dynamics. Better yet, you needn’t sacrifice performance or luxury; the V90 and XF Sportbrake offer both in spades. But which fancy station wagon is the better choice to be your all-round everyday driver? 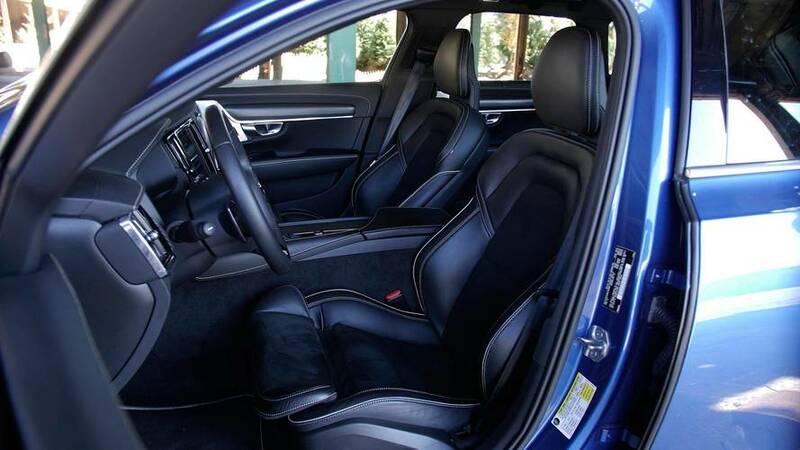 The Volvo V90 is a knock-out, especially with our tester dressed to the nines in 20-inch wheels, brushed-metal trim, and sharp Bursting Blue Metallic paint. An incredibly clean and simple design, the V90’s sheet metal is broken up by ultra-modern, skinny lights. Its proportions are fabulous, especially for a front-wheel-drive-based car, with an ultra-short front overhang and a taut, angled rear pillar giving the long wagon an athletic appearance. Yet if it’s traditional beauty you seek, the XF Sportbrake is the car to covet. 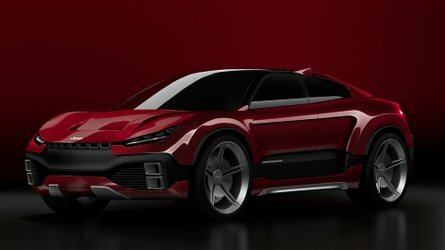 Its bodywork inspires words like gorgeous and sultry, with flowing metal draped over big hips, a more gracefully sloping roofline, and a wide stance that implies a whole lot of sportiness. 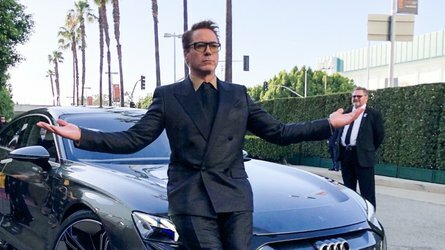 Graceful yet contemporary, tidy yet sporty, the Jaguar is the car that received unsolicited praise from passersby and car-wash attendants – and a universal vote for the styling category from every Motor1.com editor. 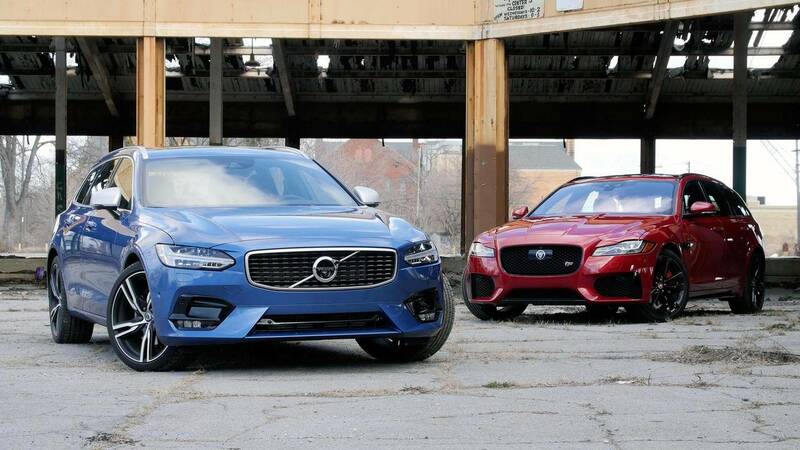 The distinct design languages make it appear as though the two cars are different sizes, but in reality their dimensions are essentially identical: the XF’s wheelbase and length are both just 0.7 inch greater than the V90’s. And, as we’ll discuss more below, the divergent shapes do not make for a big difference in cargo-holding ability. Driving the V90 T6 is a lovely experience, with precise responses from every control, predictable power delivery, and well-judged suspension tuning. 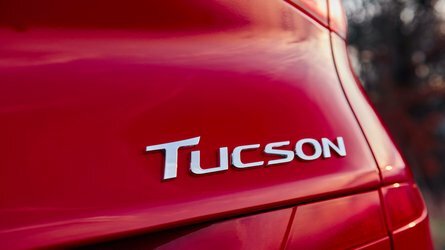 The 2.0-liter engine uses both a turbocharger and a supercharger to feed its four cylinders, so you’re never at a loss for power – ratings of 316 horsepower and 295 pound-feet of torque are nothing to sniff at. Yet passion can be tougher to find at the helm of Volvo: its engine note is forgettable, its handling competent but unexciting, and its acceleration a smidge less impressive (5.8 versus 5.3 seconds to 60 miles per hour) than the XF S.
Then you get in the Jaguar. Not only is it more powerful, with 380 hp and 332 lb-ft from its supercharged 3.0-liter V6, but that power is dispatched with more thrill and charm. The engine growls and purrs, the steering weight ramps up dramatically, and the strong brakes have a firm pedal that inspires much more confidence in brisk driving. 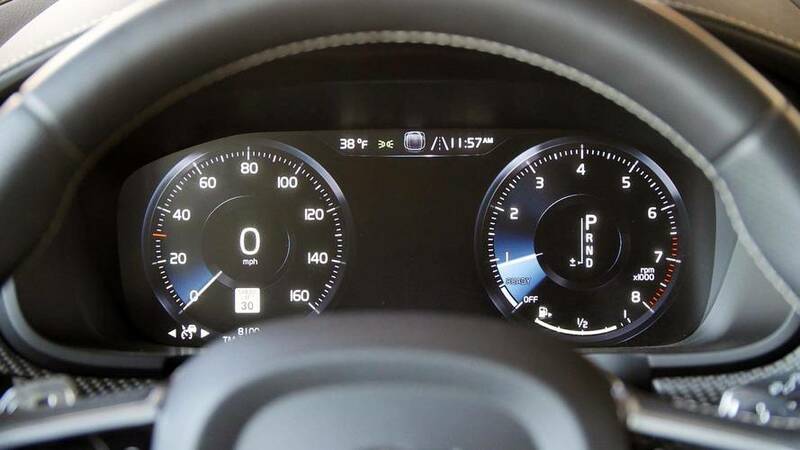 You’ll also find more reason to play around with the XF’s various driving modes because they elicit greater changes in performance than the Volvo’s. Dial the Jag up to Dynamic and put the transmission in Sport for a car that encourages you to hustle and push through freeway interchanges; move back to Normal or Eco for a more wafting, easy-going nature. It’s worth pointing out that the Volvo came riding on Pirelli Sottozero winter tires while the Jaguar had Pirelli Cinturato P7 all-season rubber. 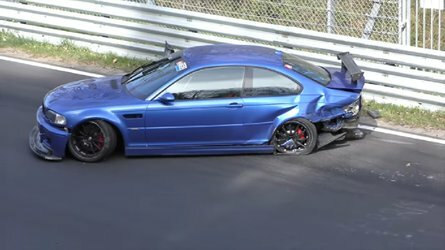 Yet as we drove the cars on dry-but-cold roads, we don’t believe the difference in tire compound had a major impact on our evaluations of the cars. When it comes to more everyday driving pursuits, both wagons do an admirable job of keeping their occupants calm and comfortable. At a push, the V90 admits a tiny bit more road and suspension noise to the cabin, and can feel just a touch brittler over broken roads. Jaguar’s cabin earns positive points for its straightforward design and user-friendly buttons and switchgear, plus neat details like that rising rotary shift knob. Yet it feels unimaginative, with lots of black plastic and straight lines that do little to excite our senses. In terms of the sensible stuff, the center cubby has only enough room to store a pack of cards, the door pockets are small, and front-seat occupants feel more cramped than in the Volvo. That’s because the Volvo manages, cleverly, to produce the opposite of claustrophobia. There’s a fantastic view out forward thanks to the expansive pieces of glass and low cowl. As on the outside, the design language is clean, pure, and tidy. 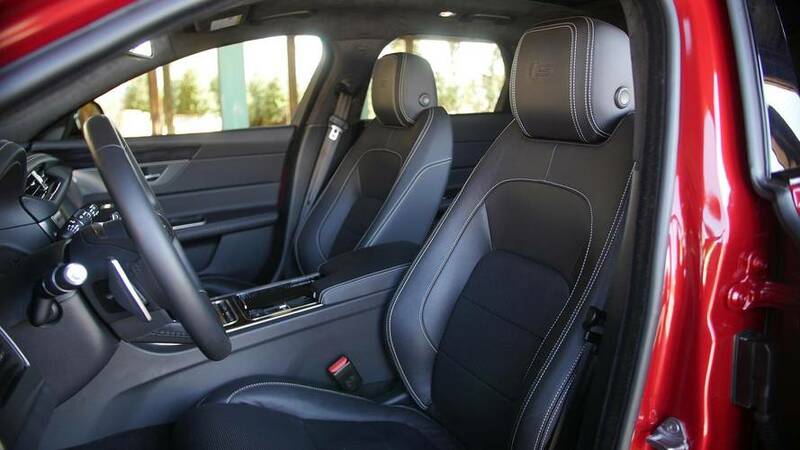 That’s not to say it isn’t stylish or highly designed: drilled-metal speaker grilles, a stitched-leather dash topper, and even carbon fiber trim adorned our tester. And the seats! Collapse into them and stay comfy for hours on the road. Volvo also provides more over-your-shoulder visibility: the rear window and rear quarter windows are larger to begin with, while power-folding rear headrests keep your view unobscured. All told, the V90 feels airier, more contemporary, and ultimately the sort of place we’d rather spend time for car journeys short or long. Don’t be fooled by appearances: we all expected that the curvier XF would offer less storage room in its cargo hold than the boxy V90, but the truth is the two couldn’t be more closely matched. 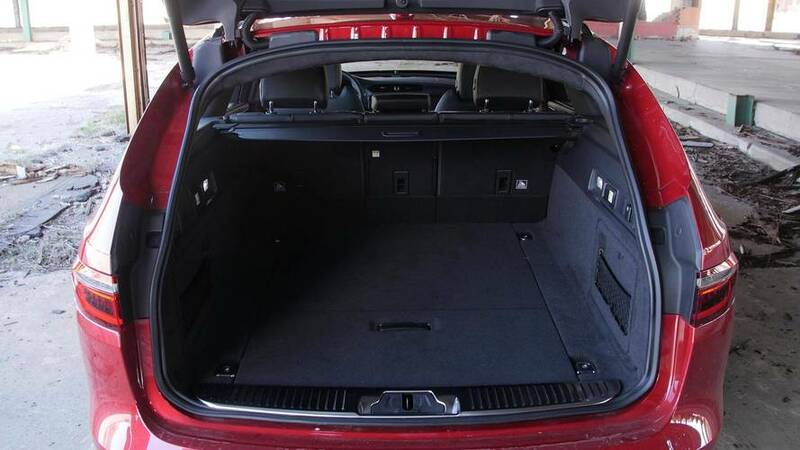 Lower the back seats and you’ll find 69.7 cubic feet of room in Jaguar’s Sportbrake, to 69.0 cubes in Volvo’s V90. Both offer wide, flat load floors, too, that make loading bigger items a cinch. And, we have to note, both offer much lower liftover heights than you might find in a comparable crossover or SUV. 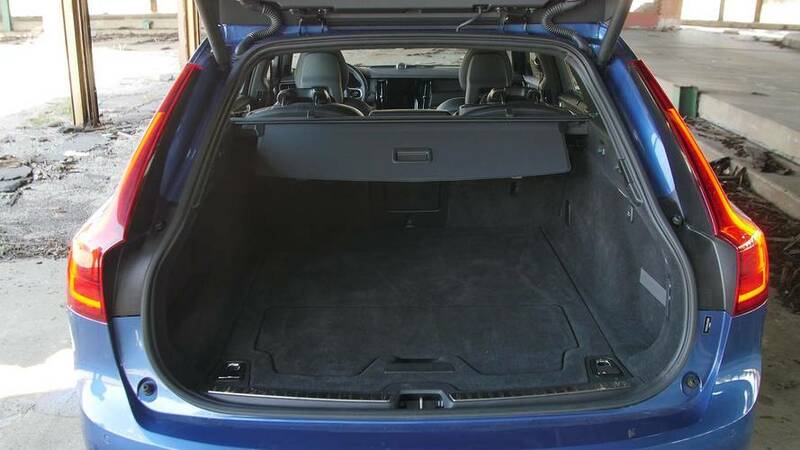 The Volvo benefits from a handy pop-up cargo divider that will prevent your grocery bags from wandering as much, as well as prominent tie-down hooks. Both wagons also have roof rails as standard, though you’ll need to equip your own cross bars (either from the dealership or the aftermarket) before mounting your kayak/bicycle/roof box/Christmas tree atop the roof. When it comes to the number and types of technologies, the XF and V90 compare nicely: Both are equipped with things like a power liftgate, heated steering wheel and seats, all manner of active safety features (pre-collision braking, blind-spot warning, adaptive cruise with lane-keep assist, etc), and adjustable drive modes with adaptive suspension. Sometimes, however, the Jaguar’s systems can frustrate. Its infotainment system takes an age to boot up and can hesitate before responding to inputs, and the views from the parking cameras are not particularly crisp. We also detected more than a few false alerts from the active blind-spot system when changing lanes in busy traffic. Volvo does all the same things – just a little bit better and in a manner that’s easier to use. 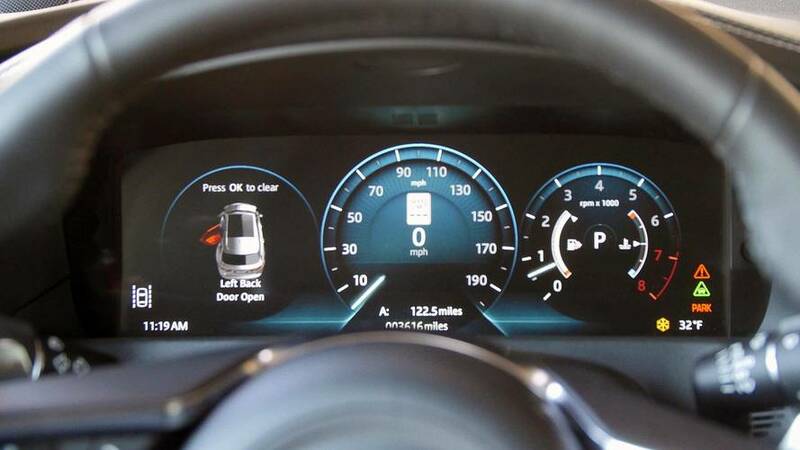 On the active-safety front, for instance, Pilot Assist does a better job keeping the V90 within its lane when using the adaptive cruise control. The nine-inch vertical touchscreen infotainment system works as fluidly as your tablet, with ultra-crisp graphics and simple menus that are a breeze to operate while driving. (And, unlike the Jag, Apple CarPlay/Android Auto support lets you plug in your phone.) Volvo’s 360-degree camera system presents crisper images of your surroundings when parking, its musical alert chimes are more mellifluous to the ear, and its full-color, 12.3-inch instrument cluster is a marvel of simplicity and legibility. The XF is no slouch in the tech department, but it feels like using last year’s smartphone compared to the Volvo. Though the Jaguar is a little bit lighter (by 144 pounds), it carries two more cylinders and an extra liter of displacement compared to the Volvo. As a result, it’s the straggler in fuel-economy testing. The EPA rates the XF S Sportbrake for 18 miles per gallon city, 25 highway, and 21 combined. Volvo trounces that, with the V90 T6 coming in at 22/31/25 mpg. More important, because Volvo offers the V90 with a lower-power engine and front-wheel drive, even more efficiency is available for buyers concerned about fuel bills: Buy the 250-hp V90 T5, and you’ll get an impressive 24/34/27 mpg. Both cars require premium fuel. Ultimately, pricing is almost identical for fully loaded examples of the Jag and Volvo, but it’s the V90 that offers a much more approachable pricing structure. With near-identical equipment lists, our test cars had sticker prices within shouting distance of one another – $71,445 for the XF S and $68,290 for the V90 T6. What’s more telling, though, is the total price walk for each wagon. Jaguar sells the XF Sportbrake here only in S AWD guise, meaning that there’s no cheaper choice than the $70,450 base price of this car. Volvo is far more democratic, offering the V90 in various trim levels, as well as with a less-powerful engine and front-wheel-drive layout. If you can manage without the power and goodies on our test car, a V90 can be in your driveway from as little as $49,950. On the other hand, Jaguar makes things easier for luxury-minded buyers: our XF Sportbrake tester had no optional extras because it is so well-equipped from the outset, whereas the V90’s spec sheet lists 10 paid options that you’ll need to elect if you want all of the goodies featured here. There’s no loser in this battle; both the XF Sportbrake and V90 are lovely vehicles that we’d all love to call our own. 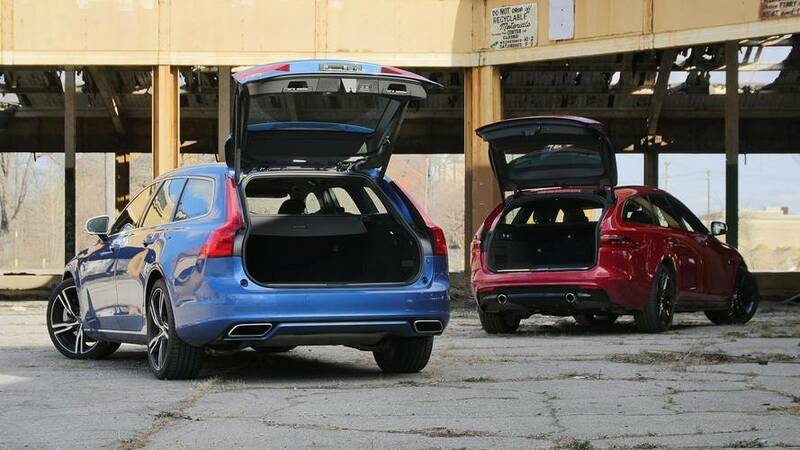 In fact, every editor involved was surprised by just how closely matched the wagons are. 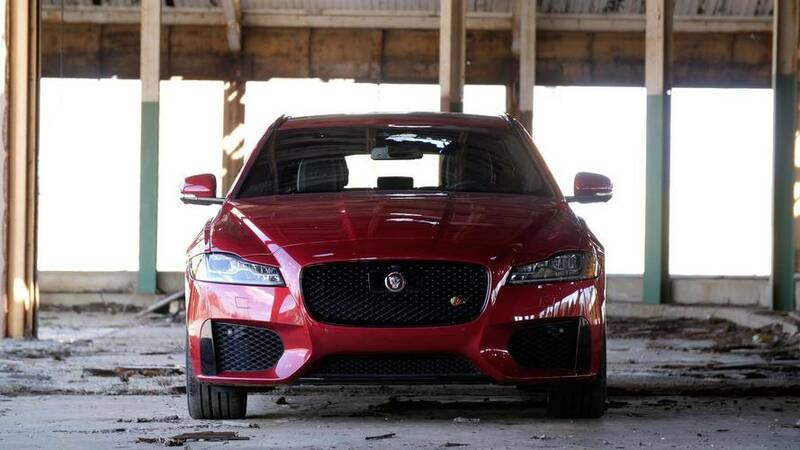 On Jaguar’s scorecard, major points are earned for beauty and sportiness. 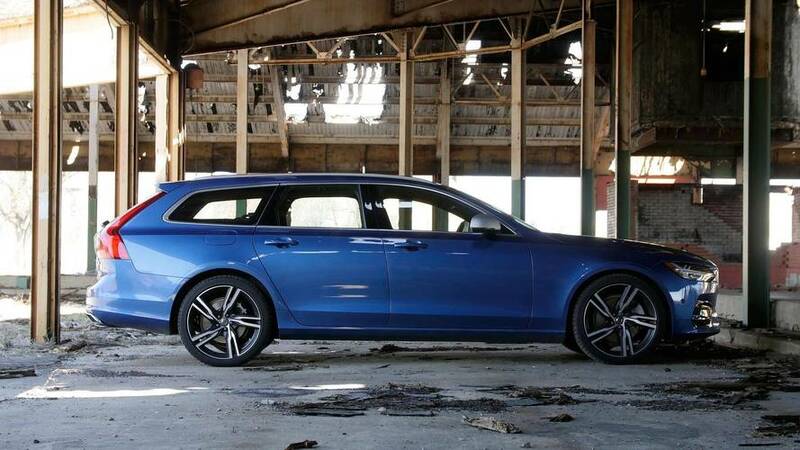 It’s a more emotional and thrilling take on the luxury wagon, the one we’d choose for a twisty-road blast due to its superior driving dynamics. 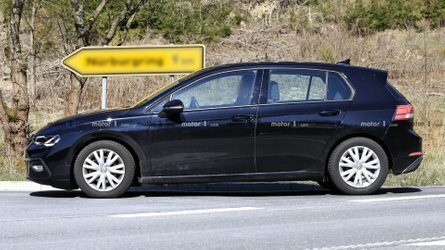 And despite those right-brain virtues, the XF Sportbrake gives up nothing in terms of roominess or usefulness to its Swedish rival. Yet looked at holistically, the Volvo V90 delivers a more balanced picture of what we expect from a premium wagon. 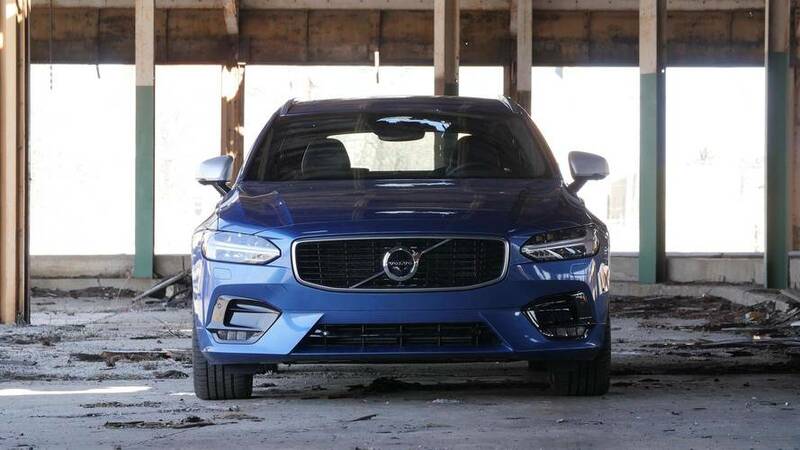 With a fresher, airier interior; newer technologies; and a more well-rounded driving experience, it’s a forward-thinking and modern take on the luxury station wagon. And while offering all those benefits, the V90 gives up only a little in terms of driving fun and satisfaction compared to the Jag. 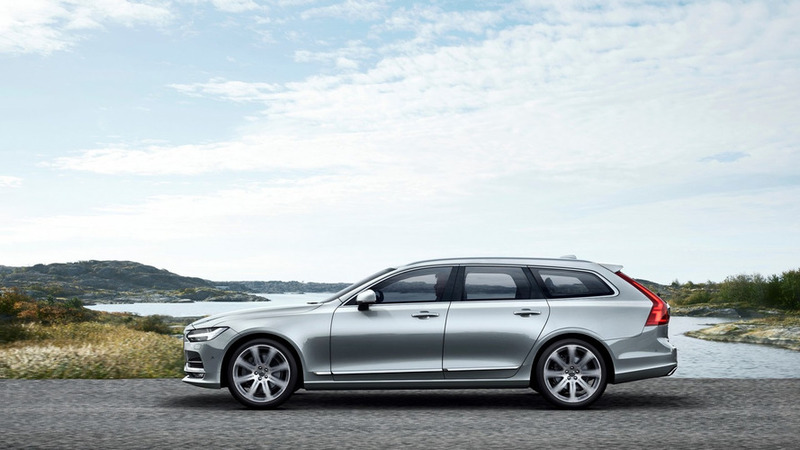 Add in its more impressive fuel economy and the fact that lower-priced trims are available for budget-conscious shoppers, and it becomes even clearer: the Volvo V90 will make more sense for more buyers, more of the time.